On March 26 my band, Paul Hawkins & The Awkward Silences, are playing at Club Attitude, run by the organisation Attitude is Everything. It’s a gig I’m really looking forward to (and one you can get cheap tickets for by clicking this link). 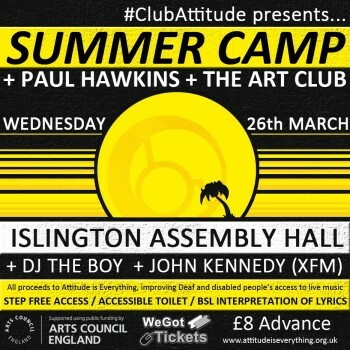 It’s a utterly fantastic venue and I’m very excited about playing with Summer Camp and the Art Club but the main reason I’m looking forward to it is because Attitude is Everything are all about making gigs accessible for people with disabilities and hearing difficulties. As a disabled person making music, this is a cause that’s very close to my heart, especially as my thoughts about my disabilities are something I wrestle with a lot. My disabilities aren’t particular visible so I don’t ‘look’ disabled and how disabled I feel changes depending on where I am and what I’m doing. I certainly feel a lot less disabled than I did when I was a child, a teenager or even my early twenties. I rarely feel disabled at work, never feel disabled when I’m on stage, often feel disabled when I meet new people (especially when trying to chat up women!) and feel extremely disabled if I wake up with a hangover. Ultimately I suppose it comes down to how much I feel I can or cannot do the things I want to do for health reasons. When I was growing up, nobody really knew what the extent of my disabilities would actually be. People seemed to assume the worst. Shortly after I was born, my Dad’s work colleagues sent my parents a sympathy card, my local primary school didn’t want to take me as they thought I wouldn’t be able to cope in mainstream education and the worst case doctor’s scenario had me needing constant care for the rest of my life. These aren’t things I tend to talk about these days but they’re very much there in my mind, especially in darker moments. I’m very grateful for the fact that my parents pushed very hard to keep me in mainstream education, get support from my school and to find ways that I could do pretty much anything that any other child could do. Now that I’m an adult, I can pass for ‘normal’ and generally I do – certainly I’d guess there will be people reading this who know me but previously had absolutely no idea about any of this side of my life. But nonetheless it’s still a big thing in my mind. The effort I spent as a child and in my teens trying to get away with seeming normal took its toll psychologically and, even as an adult, there’s certain aspects of myself I’ve never quite come to terms with and quite possibly never ever will. Disabilities tend to loom large in quite a few of the characters I create in my songs and I think that the struggle between trying to decide to appear to the outside world as ‘normal’ or be open about the fact you’re different is a recurring theme in my writing. Up until now I’ve largely gone down the route of appearing ‘normal’. For a few years now, I’ve thought about being more public about discussing my disabilities – and indeed when I first met with Attitude is Everything a couple of years ago, it was because I was thinking about entering into a public discussion about the experience of disabled musicians and fans in small venues and was going to start a blog where I shared experiences with other disabled musicians. In the end, I refrained from doing this as I don’t really like labels as a general rule and I didn’t want myself or anyone else to wear one. But it was a big thing for me during my childhood that there were few disabled role models around – and certainly not ones with the same conditions that I had – and I’ve always been aware of a certain contradiction that, on the one hand, I’d quite like to talk about my disability more, if only just to let young people know that disability need not be a barrier to achieving the things you want in life but, on the other hand, talking about it risks getting you pigeonholed as that disabled musician, which doesn’t really seem to remove any barriers at all. But ultimately talking about disability and promoting disability awareness is important and worth doing – especially given that, as I said earlier, how disabled I feel depends on the extent to which I can or cannot do what I want to do, due to health reasons – if other people feel similar then it strikes me as a good reason to make any simple adjustments needed to help people feel they can do as much as possible. So whilst the absolute last thing I want is to become preachy or be seen as ‘that disabled author’/‘that disabled musician’, I do want to start spending a bit of time on this blog taking more about my disabilities. So what will I be doing? I’ll be writing some articles and doing an interview of the Attitude is Everything website. I’m also going to upload a couple of videos of me taking about my disabilities and the equipment I use and also a podcast of some of my songs that are influenced by disability and me talking about them. I’ll also be writing more articles about being a writer and musician and other stuff to avoid any risk of me just ‘banging on’ about being disabled but hope, if it is a subject that interests you, the articles’ll be useful and informative. I’ll try to make them reasonably entertaining too!